Tristan Thompson and Khloe Kardashian attend the Klutch Sports Group "More Than A Game" Dinner Presented by Remy Martin at Beauty & Essex on Feb. 17, 2018 in Los Angeles. This week rumors arose that Thompson cheated on his pregnant girlfriend, Kardashian. 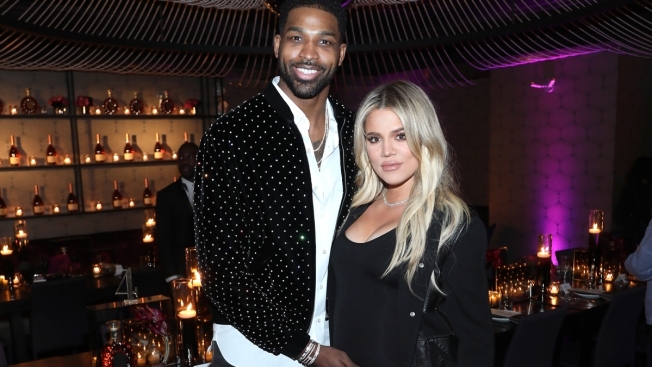 Pregnant Khloe Kardashian is "distraught" and in "complete disbelief" by reports that boyfriend Tristan Thompson allegedly cheated on her. On Tuesday, there were multiple reports that claimed the Cleveland Cavaliers player had kissed and otherwise intimately engaged with other women, reportedly as recently as last weekend. The reports included photos and videos. Thompson and Kardashian have not commented. "She's distraught," a source told E! News exclusively on Wednesday about Kardashian, who is due to give birth to a baby girl, her first child. "Her entire world has been turned upside down. She cried hysterically all night. She begged to come back to L.A. and tried to find any way to make it work but her doctor wouldn't let her. She just wants to be with her family and leave as soon as possible. Kris is there and completely supporting her." Kardashian has been at her and Thompson's Cleveland home for the past few weeks and has said she wants to give birth in the city. A second source told E! News that her mom Kris Jenner is already with her in Cleveland and her sisters will also travel there later. "Everyone is in crisis mode and is trying to be very calm for Khloe," the source said. "They are really worried for her. They are worried about the health of the baby and thinks she will go into labor any second. "Khloe moved her life to Cleveland for Tristan and made sure he was a priority so something like this wouldn't happen," the source continued. "She feels defeated and betrayed. Kris has been there to help calm her. They are all really worried, and all of the sisters are dropping everything to be with her. They all keep reassuring her that everything will be OK and to stay calm for the baby." "At this point in time, Khloe doesn't want to speak with Tristan," the source said. "And the family is keeping them apart until she goes into labor." Kardashian and Thompson began dating around the fall of 2016, while his ex Jordan Craig was pregnant with his first child. She gave birth to a baby boy that December. "It's really sad but nobody is that surprised just because of who he is," a third source close to the Kardashian-Jenner family told E! News. "A young athlete with a baby from another woman when he first got with Khloe." Thompson, who is a forward for the Cleveland Cavaliers, was booed during Wednesday’s home game against the New York Knicks. It was his first appearance out in public since the rumors.